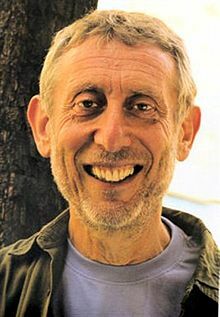 Michael Rosen (born May 7, 1946) is an English poet and children's novelist. He was the UK Children's Laureate until 2009. Anyone who was once a child should have at least one children's book in them. The competition between chunks of capital is getting fiercer, there is the same old same old desperate need to keep wages down, desperate need to substitute machines for labour (but that costs trillions of investment) and no matter how hard you exploit workers, you still need to sell stuff to them, and if their wages are low, they can't buy the stuff. You can force the poorly paid into borrowing money (credit cards, wonga etc) but there comes a point when that causes a credit crisis: someone somewhere says they want some dosh and a bank somewhere says they haven't got the dosh (Northern Rock, last time). Let's remember, none of this is caused by migrants or left social democrats. This is a crisis entirely born from a system that is locked into competition for markets. So, these fervid rows between squadrons of extremely unpleasant individuals are rows between people who deep down know that they can't control this system of running the making and distribution of the things we need. They are just coming up with fantasies on how to stay in power while the next phase veers from crisis to crisis. It is terrible for millions of people in awful insecure, low paid jobs and/or in insecure, lousy housing, or if they are disabled, or for millions trying to migrate their way out of poverty and despair. We should be alarmed when members of the ruling class start pleading with us to take sides with them against the 'elite': one section of the elite calling for us to oppose the elite. He wanted to make a mirror. Glass, mercury and a wooden frame- the perfect mirror. But he was no good at it. So he went to the people he knew and asked them for a mirror. All they could give him were bits of old mirror. He took these home, stuck them on a board and hung it up. It's a mirror. "dear joe, your wild noisy huge brother is dead. bring two boys, four years apart through the maze." It's nice of you to say you'll always remember him. You won't. be good to you. Except one." it's possible to carry on." "Bloody music. I hate the way it infiltrates." "It didn't work out the way it's supposed to." "Sometimes because I'm sad I do bad things. I can't tell you what they are. They are too bad. And it's not fair on the cat." Sad is anywhere. It comes along and finds you. This page was last edited on 12 August 2018, at 12:57.